District Governor Andy Hagan was our guest speaker this week. He updated us on Rotarian happenings on international, national, and regional levels. 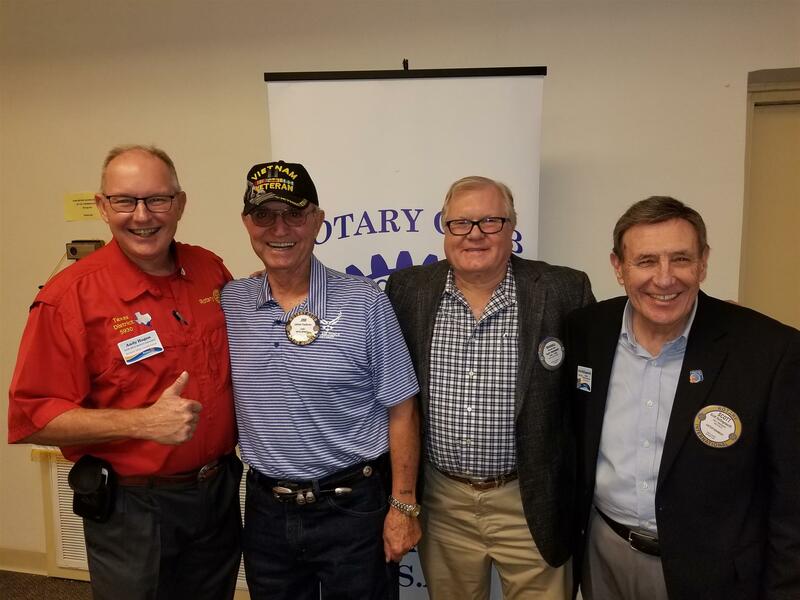 Veterans of Foreign Wars, Member Post 3972; The American Legion, Member Post 369; Victoria Board of realtors; Beef Master Breeders United Association; retired Military Officer’s Association; Texas & Southwestern Cattle Raisers Association. Andrew and Elsa, his loving wife of 32 years and his whole family share a passion for “Doing Good in the World” by supporting The Rotary Foundation. Andrew and Elsa are Multiple Paul Harris Fellows, Major Donors, and Bequest Society members having included The Rotary Foundation as a beneficiary in their estate plans. Alexandra, their daughter and Jose Barba, her husband as well as James, their son and Emily A. Hagan, his wife are all Bequest Society members. Both Alexandra and James are Paul Harris Fellows. bowling, hiking, camping, and traveling to other countries with his family.